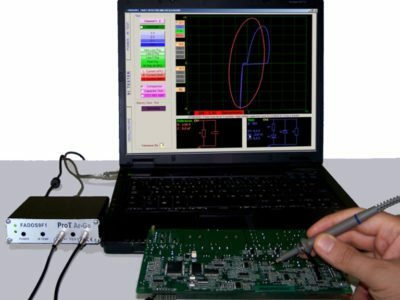 FADOS multifunction circuit board testers have been specially developed by ProT Ar-Ge to determine and troubleshoot faults at all type electronic circuit boards. They are basically computer based VI testers. 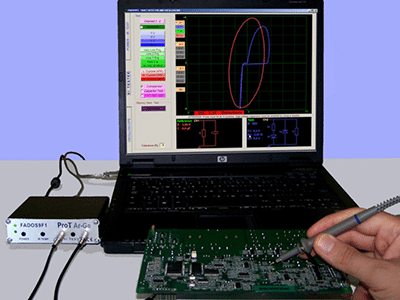 The Fados 9F1 which stands for FAult Detector and OScilloscope 9 Functions in 1 . 2 unique features are added to the FADOS9F1 over the FADOS71. First feature is the Programmable DC Power Supply; It can be adjusted between 0-16V and 20-1500mA with power output; the DC Voltage/Current graphs of the electronic card power supply can be produced. 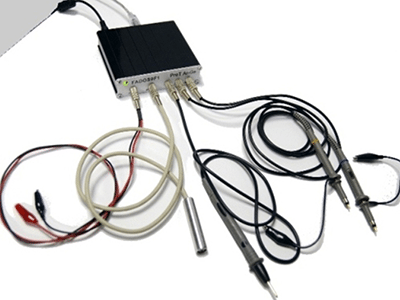 The second feature is the “IR Remote Temperature Measurement Sensor”; this sensor is used to find the components that heat up by drawing too much current. In this technique, the power cable is connected to the input of intact board and the voltage is adjusted to the maximum value. By pushing the “Power Test” button, the voltage is adjusted from “0” to the desired voltage in 100 mV increments and the voltage-current graph is obtained, which can be recorded when needed. After waiting a few minutes, the temperature map can be obtained by measuring the temperature of the components with the IR sensor. DC Power Source: Adjustable between 0-16V and 20-1500ma with power output. IR (Infrared) Sensor: Shows the difference between 0-120 degrees according to room temperature.